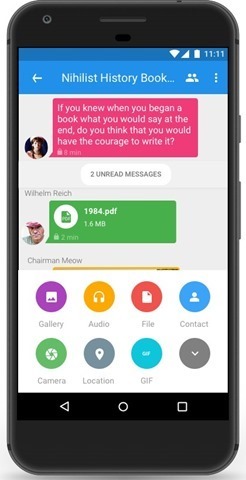 Signal, the popular open source and encrypted text messaging app, has been updated for Android, iOS and PC (well, technically it is a Google Chrome extension), to add support for sending arbitrary file types. This is actually a feature which has been requested for a long time, from 2014 according to the app's github. What are arbitrary file types? Document file formats such as text, PDF, and archives such as zip can be classified under arbitrary file types. And yes Signal now lets you send PDFs and texts via its app, which is amazing. Just hit the attachment button (paper clip), and select file, browse to the folder which has the document and hit the send button. Signal Private Messenger has another new feature in that it now supports jumbomoji, i.e., when your message contains just an emoji, it will appear larger. The Signal app, as you may have seen from our previous coverage, already supports video calls and audio calls, support for the former was added recently for both Android and iOS. Download Signal from the Google Play Store, or the iTunes App Store and try out the feature. For some reason Signal has jumped straight from version 4.3.2 to 4.5.3 on Android. Cancel sending an email after you click send, here is how to customize it and use it.